Don Gustavo ground sweet chocolate laced with cinnamon and covered in coarse sugar. Ingredients: Sugar, cocoa beans, roasted peanuts, cinnamon and soy lecithin. While keeping 60 years of quality and tradition of Don Gustavo's family, they have created the Don Gustavo Gourmet Style Chocolate, to satisfy the most qualified taste. Only the finest ingredients are mixed in this old family recipe and processed in small quantities at time, allowing you to enjoy the best aroma and flavor in your hot chocolate and mocha beverage drinks. Don Gustavo Chocolate is pleased to share this family secret with you. 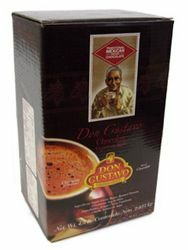 Don Gustavo Gourmet Style Chocolate is manufactured by EUROL - Chocolates Selectos de Jalisco SA de CV. Manteniendo la tradici?n y la calidad de 60 a?os de la familia, Don Gustavo ha creado un Chocolate Gourmet Tradicional Mexicano Molido, para satisfacer hasta el paladar mas exigente. El Chocolate de Mesa Don Gustavo en polvo esta elaborado con los mejores ingredientes procesados en cantidades peque?as, como la antigua receta familiar, para disfrutar de un exquisito aroma y sabor inigualable en su chocolate caliente y bebidas de moca (chocolate con caf?). Chocolate Don Gustavo se enorgullece de compartir este secreto familiar con usted. El Chocolate para Mesa molido Don Gustavo es ideal para prepararse en bebidas con leche. Chocolate obscuro en polvo. El chocolate Mexicano es delicioso con churros, pan de muerto, conchas o rosca de Reyes. El Chocolate Don Gustavo Estilo Gourmet esta elaborado por EUROL - Chocolates Selectos de Jalisco SA de CV. Para mayor informacion favor visitar Don Gustavo Chocolate. it's nice chocolate, but I would not have ordered it at that price had I realized half of it's weight was sugar. I do want to compliment you on your excellent fast shipping, though. This is awesome in my cafe mochas! So nice to find it already ground!